Tim and Jeri with Dan Chan the Magic Man. 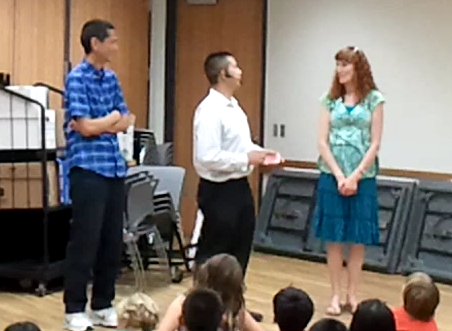 This evening, the Fountain Valley Library hosted Dan Chan the Magic Man to do a magic show. He asked for a couple to volunteer. When no one raised their hands, we volunteered. He’s really good and did quite a few card tricks. Unfortunately because it’s a card trick, it is hard to see. But in summary, he had Jeri say “Stop” and draw a card from the deck. She then wrote her name and wedding anniversary date on it. Then while Jeri was holding her card, he had Tim also select a card and write his name along with today’s date on it. Then Dan put the cards together in their hands. Then, with a bit of magic, the cards became one! We are now officially blocked out until August 17th! Here are a few photos. This was from March when Jessica and Sebastian were visiting us. 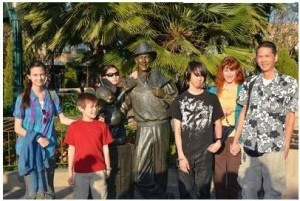 Lizzie, Josiah, Jessica, Sebastian, Jeri, and Tim at California Adventure. Here’s a cute photo with Josiah and Jeri inside of the bear’s mouth. 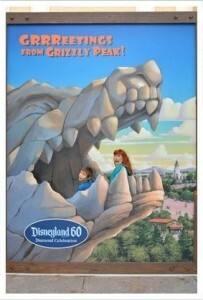 Josiah and Mom in Grizzly Peak. 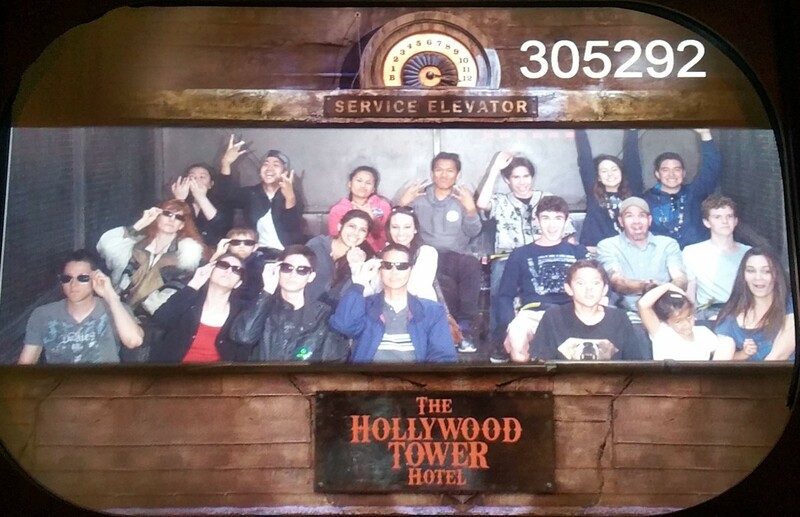 Of course, we had to come up with another new idea for our Hollywood Tower Hotel photo. Joanna had the idea to wear sunglasses. Hollywood Tower Hotel Wearing Sunglasses. Front: Justin, Joanna, Jeffrey, Tim. Behind them: Jeri and Josiah. Click photo for full size.